Swing Copters APK: Dong Nguyen is back with a new Flappy bird style game called Swing Copters, Swing Copters will be released on 21st August and the game will be available for both Android and iOS users. 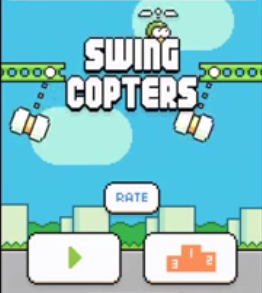 Apart from having a different type of gameplay, Swing Copters features similar graphics and controls as seen in Flappy Bird including the game UI, we have to wait and see whether Swing Copters will get the kind of popularity that Flappy Bird got. The game features a Anime Guy wearing a cap with propeller that lets him fly on you tap and all you have to do is to avoid as many swinging hammers as you can to make high score. Dong Nguyen will be releasing the Swing Copters game for both Android and iOS on 21st August. So, you'll be able to download and play the game once it's live on Google Play and App Store. If you want to install the game through APK then you can download Swing Copters APK file from Here and install it on your Android phone or tablet.